An unexpected conflict involving Russian Customs officials and unused sealed galleys is threatening the smooth operation of Pobeda, the country’s only low-cost carrier (LCC), in a dispute that has already compelled the airline to cancel its international flights from St Petersburg’s Pulkovo airport in this year’s IATA summer season. Last week, the Aeroflot LCC subsidiary announced its intention to cancel all international flights from St Petersburg in the coming high summer season. The unpopular move has been forced by changes to Customs inspection procedures that have extended aircraft turnaround times, thus compromising the integrity of the LCC’s flights schedule. The dispute comes after a series of conflicts between Pobeda’s flight crews and Customs officers over the enforced inspection of sealed galleys on board the aircraft. This led to the delays of 43 flights, according to local media reports. Pobeda insists that its does not provide catering on board its aircraft and therefore the galleys and catering holds are permanently locked and secured with special seals approved by the authorities of Bermuda, from where Pobeda’s Boeing 737-800s are registered. However, the airline has thus far failed to submit the required documentation on that specific aircraft modification and the related amended inspection checklists to aviation authority Rosaviatsiya and the Russian Federal Customs Service. The documents in question were requested as early as last summer, the authorities argue. Northern Capital Gateway (NCG), the operator of Pulkovo, which at the end of last year proudly enthused about Pobeda’s St Petersburg expansion plans and promised to help keep turnaround times for the LCC down to 30 minutes or less, is now proposing that the airline puts together a joint working group to identify a solution to the problem. So far, Pobeda has officially cancelled its flight to London starting March 17, but stresses its other five international flights (to Cologne, Milan, Istanbul, Pisa and Tbilisi) will also be suspended at least until next autumn. 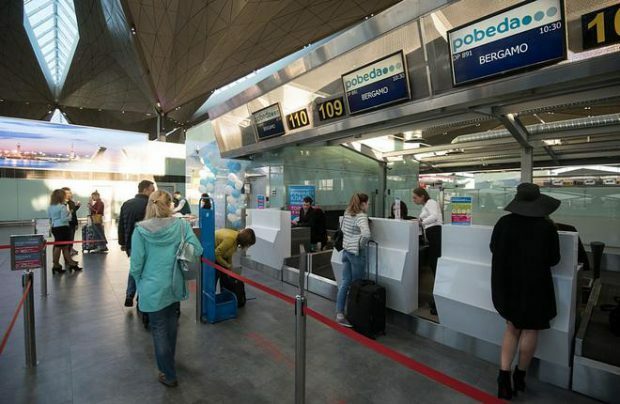 In 2018 Pobeda carried 1.2 million passengers (0.2 million on its international flights) from Pulkovo, Russia’s fourth largest airport, a 240 per cent increase on 2017. This contribution constituted some 6.7 per cent of Pulkovo’s entire annual traffic.